(Easy Piano Personality). 15 songs arranged for easy piano from the best-selling, Grammy Award-winning Christian artist whose songs are sung by millions of Christians at worship services every week. Songs include: Amazing Grace (My Chains Are Gone) * At the Cross (Love Ran Red) * Forever * Good Good Father * Holy Is the Lord * How Great Is Our God * I Will Follow * I Will Rise * Jesus Loves Me * Jesus Messiah * Lay Me Down * Our God * We Fall Down * Whom Shall I Fear (God of Angel Armies) * The Wonderful Cross. Chris Tomlin - Worship Hits was published by Hal Leonard Publishing Corporation in November 2016. 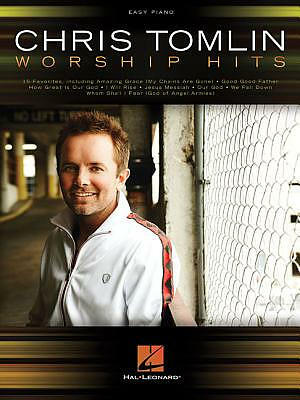 The ISBN for Chris Tomlin - Worship Hits is 9781495071874. Be the first to review Chris Tomlin - Worship Hits! Got a question? No problem! Just click here to ask us about Chris Tomlin - Worship Hits.